Heaterbands have built an unrivaled reputation for heating elements quality and reliability over the past 40 years. We formulate highly skilled and experienced personnel working with the finest raw materials. The heater bands we manufacture undergo strict quality control and detailed product testing routines. Tailor made by industry professionals to meet individual requirements. Coil heaters are typically used within the injection moulding industries and are a ‘push-on’ fit nozzle heater with optional clamping if required. Durable heat sources for manufacturing equipment used in the metal and plastic industries. Hi Temperature heat source appliances for a multitude of common and bespoke applications. Specialist heaters for drum and small vessel heating. Heaterbands (D3 Manufacturing) design and construct elements that are widely used in the foodstuffs industries. These elements range from small parts in pressure fryers to large parts parts in bain maries. A wide range of bespoke manufactured units are also supplied for household name bakeries and food manufacturers. 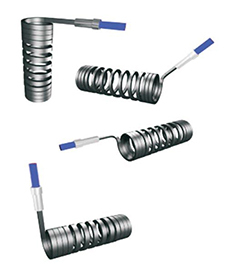 Heaterbands design and manufacture immersion heaters breweries and bakeries. Air immersion heaters are a product regularly made for drying vessels and hot cupboards. Incoloy sheathed elements are another product that an be supplied for use in backing ovens and have been supplied to many bakeries and even potteries for use in kilns. High temperature units have also been supplied for applications in the glass manufacturing industries. To compliment the heaters we also supply a full range of thermocouples and temperature sensors along with temperature controllers and premier data loggers. You may read more about heating elements applications by visiting our product info pages. We have an approved supplier contract with petro chemical companies. Heaterbands have designed and built a large variety of heaters for the packaging and labeling industry. Heaterbands have an extensive knowledge of heaters and themocouples to suit these kinds of applications. A large number of Heaterbands's heaters are used in the blow molding industries.